Today I bring you a tale worthy of a Shakespearean tragedy. If Shakespeare ever wrote a tragedy about a closet. My closet. If you're expecting to see a closet makeover like Kate's with fancy Tory Burch bags like Megan's, you will be sorely disappointed. But if you came to see the world's narrowest 1970s closet with lots of shoes piled up in a big heap, I am the blogger for you! I often wonder if people in the 1970s used closets, and if they did, what did they use them for? Our master bedroom closet is so long and narrow that it would be perfect for storing surf boards. It is so difficult to reach items on the far ends that I put things back there I won't ever need again. Like my size 6 sun dress from 2001. It is very narrow and dark and scary back there. For all I know, a pack of trolls could be living back there, waiting for me to stick my arm in there. That is why I avoid the closet at all costs. That is why my shoes started to pile up. And also maybe because I am lazy. When he threatened to throw away my shoes if I didn't do something about the mess, the fear of losing my favorite hot pink pumps whipped me into a frenzy. I'm not sure if I told you this before, but our closet pretty much stinks. I have some wire shelves that I use for shoes when I am feeling inspired. The doors are the folding kind, so I can't hang anything on them. I usually shove the out of season shoes onto the shelf in the troll infested area of the closet. The current season's shoes get to reside in the most visible area. Which is great except they were all visible. I started by pulling all of my shoes out and making little shoe stations. I had a Donate pile, a trash pile, a pile for Spring/Summer, and a pile for Fall/Winter. Once each shoe had a mate, I stored the Winter shoes back with the trolls, who am I sure were grateful. The Spring shoes got the same treatment, and seeing them so nicely lined up inspired me to pillage the closet for clothes that are no longer in style or I have no hope of ever fitting into again don't fit right now. I ended up with this pile of clothes to donate, and that's before I went through my dresser drawers and pulled out another 10 to 20 items! Because I have a lovely pile of clothes downstairs waiting to be ironed, I had plenty of hangers leftover. The wire ones went into a pile to be trashed. Oh my word, y'all, the closet door can close! Oh my word, y'all, it needs a makeover! This is the one room in the entire house that has never been painted. I'm sure you didn't notice. So, I hope you'll forgive me for sharing this trashy corner of my life today. I know it wasn't ground breaking. There was no fancy stenciling or vinyl or homemade pendant lighting involved. Just a real girl with a real closet and a real shoe problem. I have tamed the shoes! Oh, my--the cousins of my closet trolls apparently live at your house! I have a pretty large walk-in closet, but I swear there are trolls in the back corner. They sneak in at night and set up housekeeping, knowing that I'll never make my way back to that corner again. Apparently they reproduce quickly, like rabbits, because the bad back corner has somehow expanded to be the bad whole closet. Meanwhile, more trolls or perhaps something even more sinister have taken up residence in my laundry room. I re-did my laundry room back in the summer '09; I swear I did! I even blogged about it--I was so proud! Guess it's time to blog about it again. . . anything to get me motivated to put that space to rights! I often wonder about folks in the 70s, too. We have a ton of closets in this house...but none that are super useful. I keep donating clothes, shoes, bags...and there's still never enough room! What needs taming? My craft area is frightening and overwhelming,the toyroom is nightmare inducing, and the closet in the boys' room is about to burst. Yay for taming the shoes!!! Pretty much every room and closet in my home needs some love. :( Just to paint you a picture....I have kitchen appliances and dishes stored in our bedroom closet!! Not good. Hi Amanda, first, I want your pink converse shoes sooo badly! I don't think it would matter if my closet was the size of a bedroom, it would still be a mess! too funny amanda! i'm in the process of cleaning our closet-it was so bad i won't even show a picture-it's a walk in but you couldn't walk in without stepping over tons of stuff on the floor-i've sent lots to trash and have a big bag for good will and that's not even going through the shelves yet! great job on yours :) you've inspired me to finish mine by this weekend!! My closet can get out of control sometimes too. I have one of those tall shoe tree things that doesn't work very good, but it at least keeps my shoes off the ground:) BTW, I love those green wedges...so cute! Amanda, I am VERY impressed! 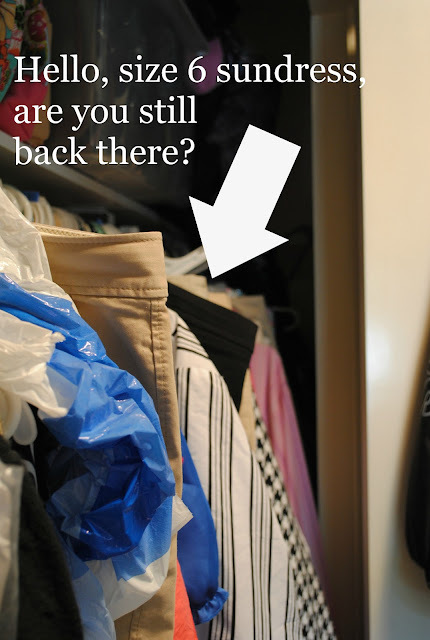 First of all, I bet the majority of our closets look like your "before" pictures. :) And secondly, you have adorable shoes! You did a great job on the overhaul! Good job, that was a lot of shoes to sort through! I don't have a closet in my bedroom, only a tiny wardrobe from ikea. it is so small it gets crazy pretty much instantly. I really need to tackle my closet too. Guess I should use this post to motivate me. Thanks...I think. I have a box in the top of my closet full of clothing I "wish" I could fit into. This is exactly the closet we had at our last house and it was next to impossible to keep organized. We finally had someone come in and build shoes shelves in the middle and then hanging on either side, one side with two levels. Changed my life. But still, those closets are rough for the shoe loving folks of the world like me, and apparently you. I desperately need to tame my "office" space. It is in need of some love and it feels too overwhelming to start. Congrats on your cleaning out. Always feels good to purge! This made me laugh. I have a early 70's closet as well, and those corners are frightening. It was very nice of you to sacrifice some shoes to the trolls. Perhaps they will stop eating your socks and single earrings. I store my out of season shoes in an under the bed rubbermaid thing. It really does help so my husband isn't always make Imelda Marcos cracks all the time :). Have a great day! It looks amazing! We need to go through our "extra" room - right now it's just boxes and boxes of stuff we don't feel like going through! Mommy Dearest? No wire hangers ever? It all looks wonderful now, but how long will it last? I am in shoe envy over all of yours, especially the pink sneakers. I want me some of them! So funny, Amanda. I love your dose of reality. Just when I was thinking you were perfect. Well, at least your trolls are well-shod! Seriously, girl, that's a lot o' shoes! Good for you for tackling the beast. I'm jealous of your long skinny closet ... my closet is about half that size! My flip flops need tamed. I have an entire over-the-door shoe rack full of only flip flops, and some slots have 2 pairs. It's ridiculous! You tamed your shoes! That's celebration-worthy. I hate closets in older houses. We have the same problem. The closets are horrible. But, my word, girl. You have tons of shoes! I'm amazed! Great work tackling the shoe pile. It looks great. haha! Shakespeare totally missed the boat when he didn't write a tragedy about a closet with evil trolls in the back of it. That's SO much more interesting than plays in which everyone dies horrific and untimely deaths. 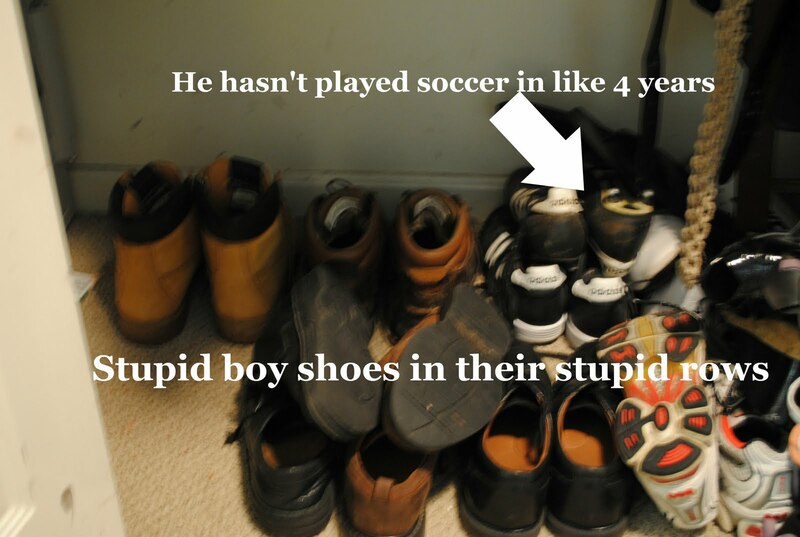 :) My husband's shoes are always neatly lined up, too, while mine are tossed in a haphazard pile. Your hard work really paid off! Very funny posting. I'm sure trolls live in my closet too. It's also long and narrow, but someone did decide to put in fantabulous 1970's sliders, 3 of them even. I am sure the trolls appreciate the fact that you let them have the out of season shoes. Seriously girl you have some cute shoes...i am loving the zebra flats:-) Woo hoo to closing the closet door and I am right there with you on the boys and their stupid lined up shoes. They just don't get it do they??? Didn't it feel good when that job was done? It looks good and now you know exactly what you have. Was T happy when he saw the result of your hard work? My favorite part of your post is this, "There was no fancy stenciling or vinyl or homemade pendant lighting involved." Not all of us have a big old closet to organize and decorate. Mine doesn't even have a light and if I did a stencil you couldn't even see it for the stuff! OMG! It is my dirty little secret too! My shoes!!! They so need sorting and taming. You have inspired me...I am off to tame! !